HOUSTON--(BUSINESS WIRE)--Axalta Coating Systems, a leading global manufacturer of liquid and powder coatings, presented during the Powder Coating Symposium held on October 13-14, 2015 in Columbus, Ohio. The two-day workshop, sponsored by Powder Coating Institute (PCI), Powder Coating Research Group and Powder Coated Tough magazine, brought together the industry’s top researchers, engineers and experts delivering sessions on the latest in coatings technology. The Symposium highlighted industry experts’ knowledge on a variety of subjects including chemistry and powder coating performance, application technology and optimizing and analyzing cure. Axalta expert and Technical Services Manager Mike Wittenhagen presented Best Practices in Effective Powder Coating Operations, an informative session that disclosed the many ways companies can improve powder coating efficiency and reduce costs. 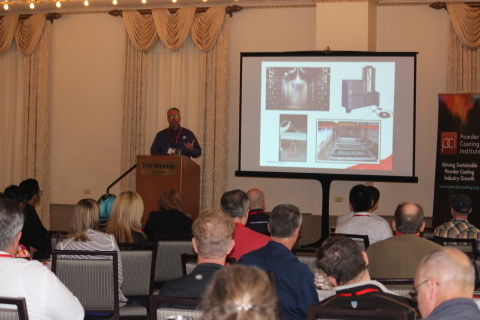 This session discussed best practices designed to keep a powder coating line running smoothly with proper preventative maintenance and spray techniques. Wittenhagen also touched on booth grounding, equipment use, common pretreatment issues and shared other troubleshooting tips. To learn about future Axalta speaking events, visit Axalta’s website at www.axalta.us/powder. For information on PCI or future events and seminars visit www.powdercoating.org. Axalta is a leading global company focused solely on coatings and providing customers with innovative, colorful, beautiful and sustainable solutions. From light OEM vehicles, automotive refinish and commercial vehicles to electric motors, buildings and pipelines, our coatings are designed to prevent corrosion, increase productivity and enable the materials we coat to last longer. With nearly 150 years of experience in the coatings industry, the 12,800 people of Axalta continue to find ways to serve our more than 120,000 customers in 130 countries better every day with the finest coatings, application systems and technology. For more information visit www.axaltacoatingsystems.com and follow us @axalta on twitter. Axalta Powder North America Manager Presented at PCI’s Powder Coating Symposium. Axalta expert speaks on powder coating innovations and technology.